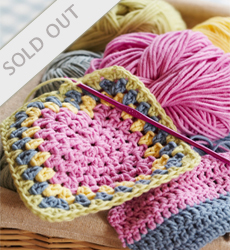 Come along and let the Woman’s Weekly experts teach you how to crochet at our Learn to Crochet Workshop on the 18 June 2014. Our team of experts look forward to teaching you how to crochet. Whether you’re a beginner or simply want to improve your technique, with our help you’ll be able to make the lovely patterns you’ve seen in magazines and books. Tina Egleton is Woman’s Weekly Technical Knitting Editor but she’s just as skilled at crochet. She checks and designs some of the beautiful crochet patterns that we feature. She is assisted by Marva Brown and our newest member of the team, Freddie Patmore. Lesley Stanfield is a freelance knitting and crochet designer and writer. She is a former knitting editor and has published several books on knitting and crochet. Woman’s Weekly has the right to change the itinerary of a day. Tickets cost £59 per person for each workshop, and will be allocated on a first-come, first-served basis. Please keep your booking confirmation, as this is your ticket for the event. A guest list policy will be in operation at the event. Shortly after purchasing tickets, you will receive an email booking confirmation: this is your ticket to the event, so please retain it for future reference. Tea, coffee and water will be provided on the day, but lunch is not included.